Sevalaya was founded in 1988 to support the economically backward people in the region around the Kasuva village (Tamil Nadu), through education, health and employment assistance. While Sevalaya’s main focus is highly-quality education of rural children, the organisation has also set up an old-age home and a medical centre providing free services to the region’s needy individuals. Recently, an Industrial Training Institute (ITI) has also been set up to provide vocational training to local youth. Sevalaya has incorporated into its programs the teachings of the poet Bharathiyar as well as Mahatma Gandhi and Swami Vivekananda. Every service provided by Sevalaya is 100% free of cost to the beneficiaries, and is provided without any discrimination in terms of caste or creed. Sevalaya currently reaches out to almost 2,000 individuals through its programs, and has generated around 100 jobs for the local youth through its activities. Sevalaya now aims to set up a university for the destitute, a community college (for vocational training) and a free hospital. 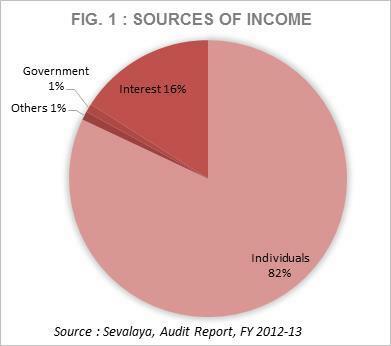 Total Income: The total income raised by Sevalaya in FY13 amounted to almost Rs28mn, increasing by 32% over that of the previous year. The largest contributor to total income was individual donors (82%, Rs23mn), which increased by around 33% from FY12 (Ref: Fig.1). The management of Sevalaya attributes the increase in individual donations to the improved system of donor engagement, using an updated donor database, ongoing communication of updates and working with potential large donor group communities. Sevalaya has a team of volunteers who are dedicated for this purpose. Investments and Investment Income: The second largest source of income in FY13 was income from investments which amounted to Rs4.6mn (16%). This was in the form of interest on fixed deposits (15%) and dividend from mutual funds (1%). The balance of investments held at the end of FY13 was Rs54mn in fixed deposits and Rs2.5mn in mutual fund units, which were at a market value of Rs2mn. 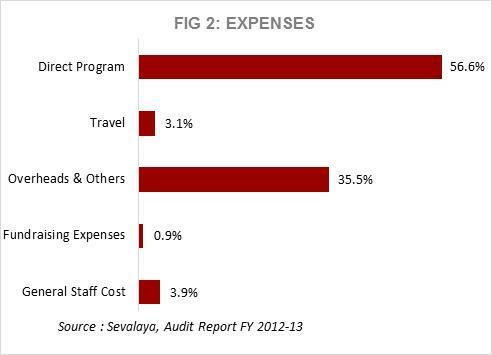 Expenditure on Programs vs. Overheads: In FY13, Sevalaya deployed around 57% (Rs13.3mn) of its expenses towards direct program activities (Ref: Fig.2), of which two-thirds was on account of salary to program staff and one-third towards program inputs. Overheads amounted to over 35% (Rs8.4mn) of total expenses, almost half of which is attributable to depreciation on fixed assets at the Industrial Training Institute (ITI). Overheads mainly comprised expenses on building maintenance, rent, printing and stationery. It is generally observed that organisations running programs with a high investment of infrastructure (schools, hostels, hospitals, etc.) have a comparatively higher ratio of overhead expenses. For example, Samarthanam Trust for the Disabled (Bangalore), also having residential schools/homes for women, spent around 35% on overheads in FY13, while Nav Bharat Jagriti Kendra (Jharkhand) having built several schools, hostels and two eye hospitals spent around 30% towards overheads in FY13. These organisations are 4-5 times larger than Sevalaya in terms of total income, i.e. the actual amount spent on overheads is much larger in absolute terms. Fundraising expenses in the form of advertising were incurred to the tune of Rs0.2mn (as compared to nil in FY12). These expenses formed around 1% of total expenditure in FY13, and have been apportioned over the various programs of Sevalaya. Expenditure on travel which formed around 3% of total expenses (Rs0.7mn) decreased by 25% over the expenses incurred in FY12. Fixed Assets: Fixed Assets at the end of FY13 amounted to Rs48mn, increasing by 23% over the previous year, on account of the new integrated campus and modern kitchen and dining hall inaugurated during the year. Surpluses and Reserve Funds: The carried forward surplus in FY13 amounted to Rs4.4mn (average of FY11-FY12 being Rs2mn). The organisation has a number of reserve funds, namely the Trust Corpus (Rs32.5mn), General Fund (Rs60mn including FY13 surplus), earmarked funds for 35AC donations towards the school (Rs2.4mn), the children’s home (Rs1.4mn) and the old age home (Rs0.9mn), an endowment fund (Rs5mn) and a fund for building the university (Rs4mn). All the reserves put together amount to Rs107mn, which is almost 5 times the total expenditure for FY13. Sevalaya has no current liabilities as on the end of FY13. Income Growth Rate (IGR): The IGR of Sevalaya was a little over 32% in FY13, owing to the increase in individual donations and investment income during the year. This is an improvement over the IGR in FY12 (12%) and can possibly be attributed to the increased spend on advertising in FY13. Self Sufficiency Ratio (SSR): The SSR measures an organization’s ability to cover operating costs from its more steady sources of income such as individuals, investment income, beneficiary fees, etc. Given Sevalaya’s reliance on individual donations and investment income, its SSR has been very healthy over the past three years analysed (FY11 to FY13). SSR in FY13 amounted to over 140%, with the average of the said three years being around 135%. Attrition of Teaching Faculty: The first challenge is identifying suitable and motivated teachers to implement Sevalaya’s educational programs. The challenge does not end once the teachers are brought on board; there is a high attrition rate among the teaching staff, mainly owing to the modest salaries that Sevalaya can offer. Volunteer Management: Sevalaya also faces a challenge in obtaining volunteers/experienced individuals in various fields to teach and groom the students not only in academics, but also in communication, inter-personal skills, leadership qualities, etc. The Sevalaya staff also faces challenges in communicating effectively with volunteers who come from all around the world. The Board of Sevalaya currently consists of 10 individuals, most of whom come from either software engineering or social work backgrounds. One of the Board members is Mr. Ilayaraja, who grew up as one of the resident students at Sevalaya and is now a successful software engineer. He serves as a living role model for the current children at the school and hostel. The Advisory Board of Sevalaya comprises individuals from varied fields such as nutrition, public relations, communications, marketing, organic farming, etc. There is also one retired IPS officer and one retired IAS officer on the Advisory Board. Sevalaya is registered with Give India and the Credibility Alliance.